What is the best way to measure the distance between two points on a curvy river? I use the measuring tool on Google Maps/Earth. When going around a curve, just place the points closer together. Place a pin where you want to start, right click and select "Measure distance", and start dropping pins. This instrument will someday be in the drafting, mapping and engineering relics museum, along with the planimeter. I'd like to have a rubber-tired opisometer for use with on-line maps. But I had to look up "opisometer" on the internet. Perhaps it is a foreign word, because it didn't show up in my dictionary. On-line, I see you can still buy one on Amazon, along with many t-shirts and coffee cups emblazoned with the word. Is it an inside joke, or do people just find the word funny because it sounds kind of like a bathroom function? For true authenticity, I suppose one should measure the route on the map with their opisometer and then calculate the corresponding distances on their slide ruler (and then check themselves into the old fossil display at a nearby museum). never knew it was called an opisometer until I read the P Net article! Hold one end on the starting point, then carefully lay the rest of the string along your route. When you reach the end point, mark the string. Now you can straighten the string and measure it with a ruler. Look for the distance scale on the map and then just do the math. As an example,lets say your route measures 7 1/2" and the scale is 1" = 1 mile so you would be going about 7 1/2 miles. The actual mileage will vary depending how wide you go around the bends in a river but this method with give you a good ballpark for guessing distance. If you have an iPhone, get the *Distance - Find My Distance* app. Trace your finger along the curvy river on your phone and it will give you the distance with surprising accuracy. Not sure if it's available for android phones. I plot my race course for the Yukon River Quest and Yukon 1000 mile races using Google Earth and a program I wrote on MS Excel. After I manually select waypoints on GE, those coordinates are sent to the Excel program that calculates and labels each waypoint with its distance (in tenths of a mile) from the race start at Whitehorse YT. It also calculates and labels them with LT or RT for left or right turn, and a short name I manually enter if it is a significant location. It all gets converted to a route for my GPS. The route and that label information, along with distance and direction to the next waypoint is displayed on my GPS during the race. 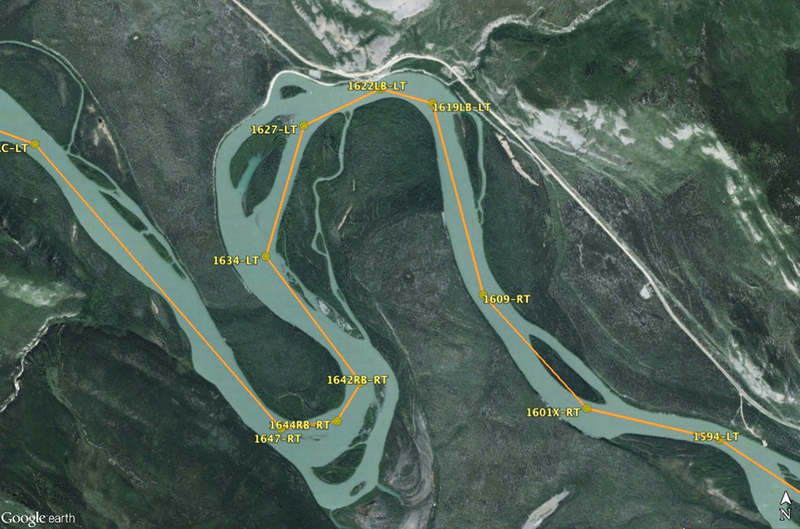 I've raced the Yukon 5 times, improving the GE waypoints (793 wpts for the 1000 mile race) each time based on what works best on the river to stay in the best current and best/fastest line. Accuracy of the calculated distance is excellent, based on comparison to actual GPS distance measurement. There is a fudge factor included to make the calculations match reality due to turns and other factors. That factor is 1.008, an extremely small multiplier. The Excel program goes on to make arrival time estimates at each waypoint, and in near-real time my pit crew can enter SPOT location data to update those time estimates for arrival time any intermediate point or to the finish line. Assuming you just want to record the distance while paddling, a gps does great. Otherwise I'm a string and map guy when at home. Sometimes I do resort to google earth, but on curvy creeks you have to plot lots of points. When out on the water, looking at a map and wanting a quick estimate I just add another half of the total distance onto the straight line distance. This works for a curvy stream, and usually is not far off. If you have an iPhone, get the Distance - Find My Distance app. Trace your finger along the curvy river on your phone and it will give you the distance with surprising accuracy. Not sure if it's available for android phones. Guide books - especially AMC River Guides. it's not exact., but close enough for me. Maybe I'm lucky that I'm in an area where there are good, comprehensive guidebooks. Like JackL said, GPS Quite accurate. Tells you how far traveled. Thanks for the tip on using google maps! Just measured out a trip I did last summer... 10.6 km! Need to extend that this summer... jeez man, bring on the heat!!! When measuring distances using GE, be sure to use enough straight line segments and be realistic about the path when rounding bends in a river. If you are familiar with where the current flows and expect to stay in it, consider that as well. A planimeter is used to compute area, not distance. If you're have downriver racer tendencies, the GPS is going to be the most accurate measure. If you're a "catch every eddy - surf every wave" kind of paddler, not so much. The Yukon in particular changes or adds the location of gravel shoals every year, but the GE coverage is for the most part only a couple of years old and fairly accurate. The biggest problem was changing water level from year to year, so some of the usual shortcuts behind islands or around bends might be either very good or gone. The available topo maps for either the Canadian or US segments are so old that they are worse than useless for navigation because of major changes in the river channel in the decades since the maps were surveyed.. The same is true of available GPS loaded maps. On the 1000 mile race near Circle AK, where we were looking for an island to camp as shown on the GPS, there was nothing but water, the island was gone. 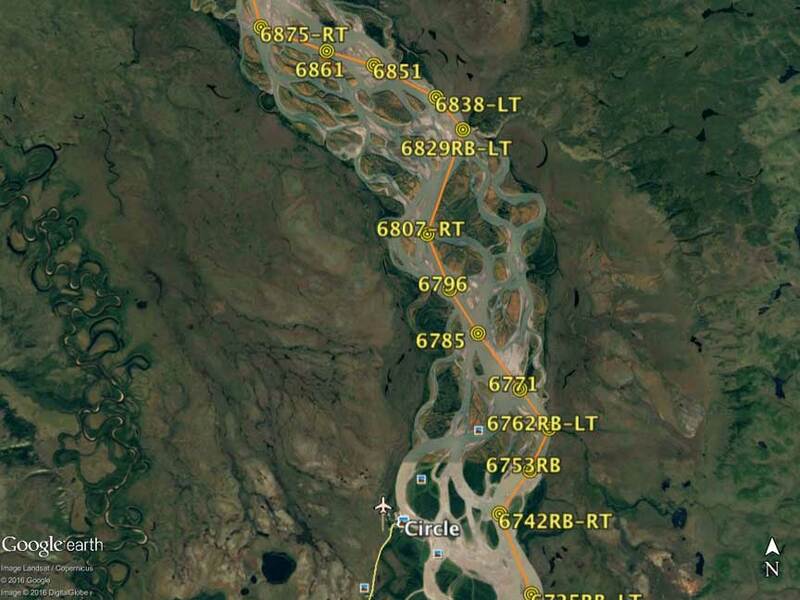 In other places as we paddled along, large chunks of earth were falling in the water with the banks of permafrost and dirt being sharply undercut. The fastest current tended to be near those undercuts but we had to be careful of falling earth and ice chunks that made large waves as it struck the water surface. The numbers shown at the waypoints on the route are MS Excel calculated distances (in tenths of a mile) from Whitehorse. The program also determines left or right turns (LT/RT) (left/right bank LB/RB and distinctive point names are manually added) and the whole of the route and waypoint labels get loaded into my GPS. I use the S-health app from Samsung. It's available on the app store (Android only I think) even if you don't have a Samsung phone. It has a kayaking module that will track your speed, distance, theoretical calories burned etc. I use the same app to track my daily steps and when biking. A good guide for distance on a river is to multiply the direct distance by pi (approx 3.14). "The pleasantest distance between two points is the meander".